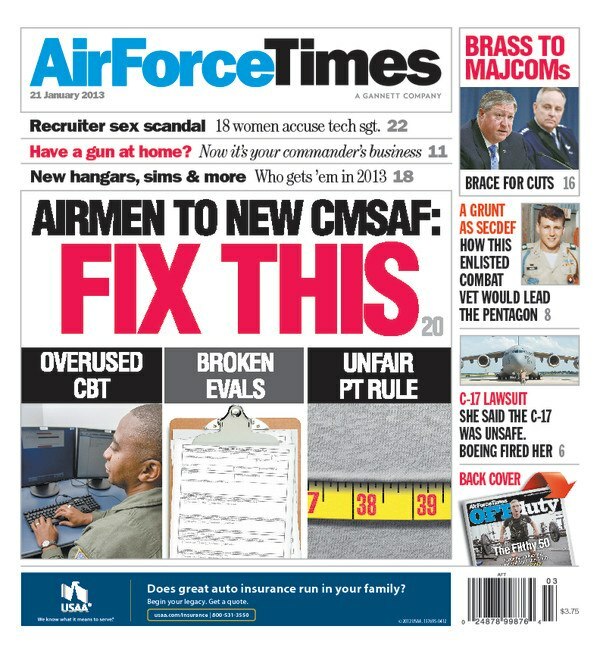 Incoming Chief Master Sergeant of the Air Force James Cody wants to know what he needs to fix and Air Force Times readers have plenty of suggestions. Read what readers think Cody should have on his “fix-it” list when he becomes the Air Force’s senior enlisted leader on Feb. 1. Also in this week’s edition, state leaders want a bigger voice in the discussion about whether the Air Force should make cuts to the Air National Guard. The service’s proposal to cut personnel and aircraft from the Guard ran into a wall of opposition last year from state and federal lawmakers. It is important that governors have a “seat at the table” during budget discussions, Gov. Mary Fallin, R-Okla., vice chair of the National Governors Association, said on Jan. 9 in Washington. Turning to other subjects, the Air Force has been authorized to spend $122 million on stateside military construction projects and $93 million for projects overseas under the 2013 National Defense Authorization Act. Projects include new dorms, flight simulators and hangars for stealth and unmanned aircraft. Read how your base might be affected. And a congressional subcommittee will begin hearings this month into the basic military training scandal at Joint Base San Antonio-Lackland, where dozens of trainers have been accused of sexual misconduct with recruits. The first hearing is slated for Jan. 23.